Not a great week in pro soccer for Philadelphians. The Union lost to a bad team. No local players playing professionally for other clubs really stood out. Sometimes, that’s just how it goes. But in a down week, even with some mixed results for the particular player, we can say that, when an 18-year-old local kid makes his professional debut for the hometown club and shows he belongs on the field, that counts for something. All that makes Philadelphia Union left back Matt Real PSP’s Player of the Week. There was good and bad for the Drexel Hill native on the field, and you can read about both here in my column on Real’s performance. Real is the latest sign that the Union’s youth academy is finally producing actual MLS players, following Auston Trusty and Anthony Fontana. Real has been in the Union system since he was playing at the U14 level. Real showed he belonged on the field, even though he wasn’t perfect. There’s likely even more potential to come. He has seen such minimal time with the Union that we have to draw on Bethlehem photos to portray him. All this counts for something. In fact, it counts for a lot. Because later this year, if he’s a productive player, this will obviously have been the week it started. Daniel Lovitz, Montreal: If he had handed out this award during the Union’s first bye week, Lovitz would have gotten it. We kind of owe him one. As it is, the left back played a fairly good game this week, but not like he did earlier last month. 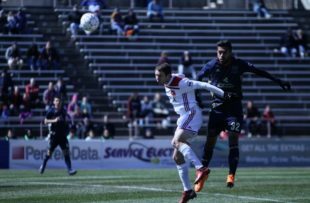 Jake Nerwinski, Vancouver: The native of Lawrenceville, N.J. started his fifth straight game at right back for the Whitecaps and has maintained his lockdown on the starting role he won last year. I do not know all the circumstances in all three of the cases I am about to discuss. So at its most optimistic the idea I propose has to be labelled tentative, quite tentative. Trusty started 44 regular season games over the course of two seasons with Berthlehem. Every appearance was a start. He was the true trailblazer from the Academy through the Steel to the pros, because most of Derrick Jones’s developing was done with Junior Lone Star and in the Philadelphia school system. (Jones did a partial post graduate year with the Academy as I have understood it, perhaps incorrectly). Fontana was slated to play a lot of games with the Steel last year but suffered two injuries, stress fractures to the tibia’s ball that fits into his hip as I think I have understood (the symptom may be deep groin pain that won’t go away), but only got a few. in total for 2016 and 2017, he made 19 appearances with nine of them being starts. Matt Real Has made 20 appearances with the Steel over the two years, 19 of them starts. There are specific circumstances that explain each player’s pattern. Trusty had some offensive skills that needed developing after he signed as a homegrown player, and there were competent MLS players ahead of him, primarily Marquez. Fontana’s injuries have been mentioned. And the injury to Fabinho threw Real into the fire, perhaps sooner than intended. But it is also possible that the organization is learning to trust its own ability to assess the readiness of players to jump to the next level. That collective skill on behalf of the assessors is an important one. And it should be said that having the more full exposure to the whole person provided by the schoolhouse, helps to judge the whole person’s readiness for the challenge. The school is represented in the assessment meetings along with the technical soccer staffs and the sports science/training people. it will be interesting to see if the Steel add any players from the Academy this summer, prior to these players beginning their senior years in high school.